130+ teams, 9 cities, and 1 Event… The DogHouse League competition includes all four disciplines of DockDogs®. Winners from each Sanctioned Facility League will be entered into the World Championship Lottery! 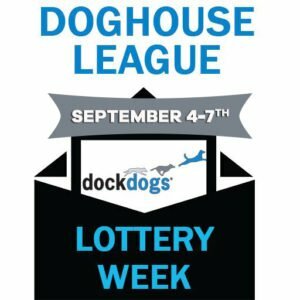 DogHouse League was a pilot program and a Road to Worlds for the DockDogs® Exclusive Sanctioned Training Facilities for the 2017 season. Nine facilities across North America participated and produced 389 entries, competing for 32 World Championship’s Invites, making this one of the largest events of 2017. The 1st Place Overall (#1 team from all facilities combined) will receive an Invite in each division of each discipline (excluding specialty divisions). “The Lottery” – the Lottery is comprised of the remaining 1st Place teams from all the facilities combined. Team names are entered in a random drawing for an invite in each division of each discipline (excluding specialty divisions).